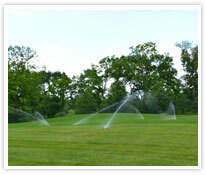 Lingo Irrigation embodies the one word slogan that is synonymous with The Lingo Group, “Quality”! 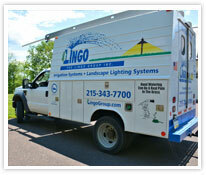 Originally established in an effort to expand the landscaping business in 1988, Lingo Irrigation quickly grew into a flourishing division of the company, servicing over 1,100 clients across the Delaware Valley. • Our Sales-Designer will meet with the client to develop a proposal specific to the needs of your property. • Careful consideration is given to each zone according to the watering requirements of the plant material and location. Planting beds require a different watering schedule than open turf areas. Lingo will design an appropriate system that delineates these areas accordingly. • An electronic modular timer will be programmed to operate each zone with the appropriate amount of water, while enabling the user to adjust the watering schedule as needed. • Upon signed agreement, the work will be scheduled and a PA One Call will be placed. Any services needed from the Landscape Division will be coordinated along with pick-up and transport of materials and equipment. 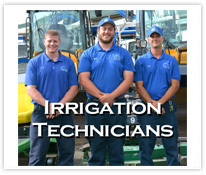 • Lingo Irrigation will complete the job with minimal disruption, in a professional and efficient manner. • Lingo offers a pre-pay discount for the selection of two or more services per year, which include a spring start-up, summer inspection, and winterization. 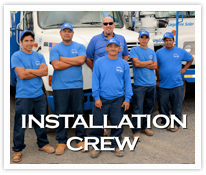 • Our technicians are well-trained to diagnose and repair any ongoing problems. • All company vehicles are GPS enabled and are well stocked with replacement parts, controllers, rain sensors, and the proper tools to complete the repair while on site.